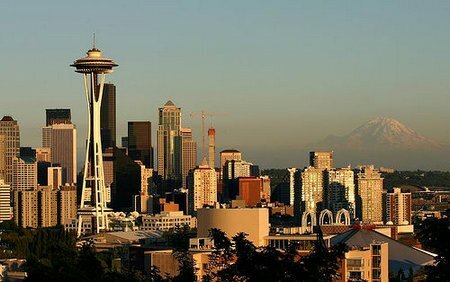 This summer we’ll be in Seattle and I’m looking forward to it. Seattle has a pretty well-deserved bad weather reputation for our damp and dreary Winter (and sometimes Spring and Fall too), but in the summer we have lazy, hazy days with the sun glistening off the waters of the lakes and the Puget Sound. The mountains east (Cascades) and west (Olympics) frame the horizon and Mt. Rainier, snow-capped, dominates the cityscape. With our northern latitude, we have long balmy evenings and glorious sunsets. I’m waxing poetical here, I know, but honestly, it’s hard not to. This July we have guests coming to stay: relatives with three children ages seven, five and three. The’re coming from Portugal (to escape the heat of the Algarve) and they’ll be staying with us for two weeks. It’s the kids first visit to Seattle and I’m eager to help them make the most of their visit and so I spent some time this past weekend planning what I hope to take them to do and see while they’re here. Naturally, as with any family vacation, these are just a list of ideas and these plans could be turned upside down depending on temperament, tantrums, weather, interests or just plain kids-being-kids. If some of these days seem short on activities, it’s because I’ve found that when planning a family trip, it helps to just plan one activity a day and to allow ample time for just hanging out and having fun – time which we don’t always get during our daily lives. Day 1: I’ll spend the day introducing our visitors to our neighborhood so that they can find important things like cafes, ice-cream stores and parks while we’re at work during the following week. This is Seattle, so it’s not too surprising that even in my almost-suburban neighborhood there’s at least eight espresso joints from which to choose. My favorites are Zoka Coffee Roaster and Diva Espresso – both local companies. For ice-cream, these kids are in for a treat since we’re lucky enough to have the original Molly Moon homemade ice-cream store just down the street and newcomer Fainting Goat Gelato in case the line at Molly Moon’s is too long (it’s a popular spot). I expect that choosing a park in which to play will be a daily occurrence for my young guests. There’s a long list to choose from, but those with wading pools will be high on the list – a perfect way to spend some quality outdoor time with younger children in Seattle in the summer. 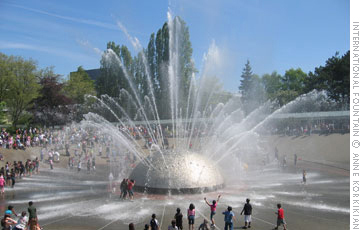 Day 2: My boys love water play on hot summer days and having a picnic by the International Fountain at the Seattle Center has always been a fun day trip. Playing around the fountain as the water and starts and stops – in time to the music – is a big hit with kids of all ages. It’s not for the faint of heart though, it can get crowded and younger children should be with a parent. If the International Fountain is just too much, the quieter, more secluded Fountain of Creation is just a few steps away on the north side of Key Arena. Before we leave the Center, we’ll take some time to check out some of the other onsite attractions including the Pacific Science Center, The Children’s Museum, Space Needle and EMP – not to mention the Fun Forest . Day 3: Today will be a Mom’s day. At the very least we’ll go for a kid-free walk, run or bike ride. I’ll make some beautification appointments in advance at either Ummelina or Habitude and we’ll finish the day at the Summer Concert Series event at Chateau St Michelle with a picnic on the lawn. Day 4: I’m not a fan of theme parks (too loud, too many people, too expensive), but I do make an exception for water parks. Wild Waves is just off the I-5, an easy 30 miles south of Seattle in Federal Way. For us, it’s always been a once-a-summer, special event – my kids are looking forward to this daytrip already! It is pricey: entrance tickets are $28.99 + tax, but this year, the City of Seattle is selling reduced price tickets ($21) at community centers through September 7th. Day 5: I’m calling this “Downtown Day”. I’ll be giving my guests tickets for the Ride the Ducks city tour and guest passes for the Seattle Aquarium. I’ll be suggesting that they stop for sandwiches at Three Girls Bakery or Le Painier on Pike Place Market for lunch but to take their food across the street to Victor Steinbrueck park where they can enjoy the sunshine and watch the ferries as they ply the sound. Day 6: If you’ve ever planned a trip with kids you’ll know that it’s important to schedule some downtime. A day or a morning where there’s nothing at all on the agenda. This day could get moved up or back or duplicated, but in all the time I’ve traveled with my boys, it’s served me well to always include a do-nothing-day as I plan our trip. Day 7: Holiday viewings of ‘Willy Wonka & the Chocolate Factory‘ is a family tradition in my family. I can’t wait to see and hear what these kids think of the sights and sounds at Theo’s Chocolates. They may be too young to remember all they learn while taking the factory tour, but I expect it will be a highlight of the trip nonetheless. Day 8: There are so many things to do at the Seattle Center that it only seems fair to add a second visit. 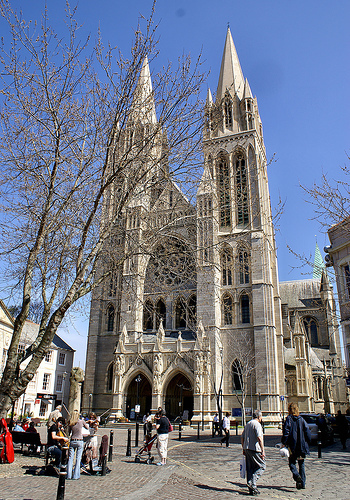 Day 9: Have you ever been a local who just never took the time to visit a prime tourist attraction in your city? I’ve never taken an Argosy Seattle Harbor Cruise but I do know – from other guests who’ve visited and taken the cruise – that it’s a fun 1-hour tour of Seattle giving a completely different perspective on the city and the harbor. (I have discount coupons from SeattleTourSaver which I can use – thanks alaskatravelgrm). Is there anything you love to do with family or friends when they come to visit which you think I’ve missed? Do leave a comment. If you’re looking for a family-friendly hotel in Seattle, check out my review of the Hotel Monaco. This entry was posted in Activities And Adventures, Exploring North America, USA and tagged Argosy Cruises, Family-friendly Activities in Seattle, Molly Moon, Seattle, Trip Plan, USA, Washington, Zoka Coffee on June 16, 2009 by wandermom.